#1630 Solid Brass Dutch Door Bolt. Antique Brass and Black are 4" long. All other finishes are 4-1/4" long. Brass 605 pictured. Actual product may vary from ie. Connects Top And Bottom Half of Dutch Door together. 4-1/4" Wide x 4-3/8" Tall. Projection 1-1/4". 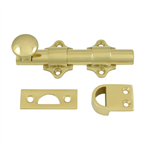 42 Pocket Door Bolt - Ideal for single or pair of doors to provide privacy function.